Don’t forget to get your pouch ready for the Roundwood Festival Dog Show which will take place on Street Festival Day Sunday 2nd of August. Prize categories may include some or all of the following:- Best Wag, Best Dressed, Dog Most like its Owner, Dog the judge would most like to take home and Cutest Puppy (under 1). Registration will be open from 2:30pm and the competition will start at 3:30pm or thereabouts. Grrr……Woof woof! Roundwood AFC is holding their Annual General Meeting on the Tuesday 11th August in Roundwood Parish Hall at 7.30pm sharp. All motions and nominations must be sent in writing to Club Secretary, Ciaran Dunne, 6 Djouce Meadow, Roundwood, Co.wicklow, to be received no later than 7 days prior to date of AGM. Yours in Sport Roundwood AFC. Join us on a walk to the newly rediscovered Lady’s Well on Carrick Mountain. This well had its pattern day on 15th August but the tradition ended in 1798. The walk to the well is to visit it on the original pattern day. Holy wells had many old traditions and people used the wells as a gathering place for music, dancing and fun with one day a year being a pattern day. If you have a song to sing or a poem to read that would be appreciated. We meet at Moneystown church on 15th August at 11a.m as the well is hard to find. It takes approximately 30 minutes to walk to the well. Wear comfortable walking shoes. The well is at the side of the Coillte roadway. There will be a short talk at the well on the history and traditions of Holy Wells and how Lady’s Well was rediscovered in 2013. The Roundwood Parish Hall monthly Dance will be held on Friday August 21st dancing to Tony Davitt from 9 p.m. till late. Teas served, refreshments also available, Raffle prizes. Come along and enjoy a night of waltzing jive. The next Car Boot Sale will be held on Sunday August 9th for Information and Booking please contact us by emailtheroundwoodparishhall@gmail.com or by ringing Bernie on 087-3932730 or Ben 087-9627527 Indoor and outdoor spaces available, Booking is essential as limited to 22 tables indoor. Open to stall holders from 10 a.m open to the public from 12 noon to 5 pm.. Tables can only be held until 11.30 a.m.
A reminder that the Active Retirement Lunch club will take place on Friday 31st July in The Glendalough Hotel at 1.30. The Roundwood and District Community Council are organising a school re-union for anyone who went to Roundwood Old School on August 1st which forms part of the Roundwood Festival. Some folks are very shy about telling us about their school days! So we urgently need help please. Can you be a reporter to ask your Mummy, Daddy, Granny, Granddad, Aunty, Uncle, family friend or great grandparents some questions about where they went to school? If it’s not Roundwood Old School it doesn’t matter. You can write out their answers or record their answers on video or audio! Make sure you explain what you are doing and ask their permission please (you can show them this notice). We might display or play some of your reports at the Old School reunion in August. We may put some of your reports into the Time Capsule which will be placed at the Old School in Roundwood after the reunion which will be opened in 100 years’ time. We might also pass on the reports to the Roundwood & District Historical and Folklore Society as they are really interested in this information. You will be a historian – recording local history that the people will be looking at or listening to in hundreds of years. There are some sample questions on http://www.roundwood.ie/festival-2015/old-school-reporters/ but you can ask some of your own if you like. Please drop your report in whatever format into the box in the foyer of the Roundwood Parish Hall by Thursday 30th of July. Everyone who puts in a report will be entered into a draw for a prize. Thank you. A pilgrimage to Our Ladys Island will take place on Saturday 15th August leaving Roundwood Parish Hall at 10a.m. Tea and scones on the way and dinner in the evening. Total cost €60 per person. For further information please contact Susan on 0404 45276 after 8pm. The results of the whist is as follows:- Top Score: Monica Brady: Top Gent: Paddy O’Brien; Second Gent: Richie Cullen & Martin Byrne (shared); Top Lady: Molly Byrne; Second Lady: Patricia Byrne; First Half: Ann Gaffney; Second Half: Mary Pierce; Lowest Score: Ann Pierce & Longest Sitting: Ann Wolohan. Raffle prizes were won by Ann Wolohan, Jimmy Molloy & Martin Byrne. The next whist will be on Wednesday the 5th August in the Parish Centre. Set Dancing on Thursday nights in Kavanagh’s Lounge from 9pm til 11am with live music Beginners and visitors to the area are always welcome. Great social night for €5! Fun family Ceili for all ages in Annamoe centre at 8pm next Friday evening 29th May. Start your bank holiday weekend with some exercise and fun! This entry was posted in News & Events on July 27, 2015 by roundwoodiewicklow. 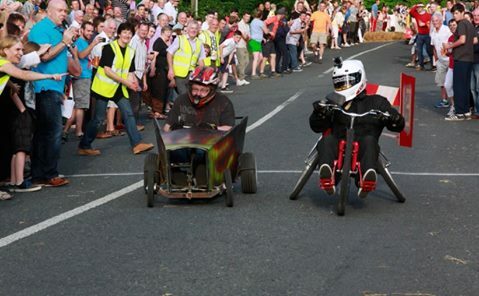 This year the soap box derby on Sunday August 2nd will be even bigger and better than 2014! 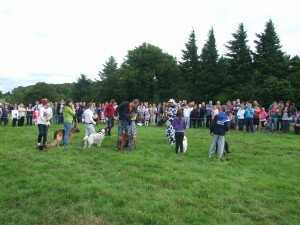 We have been working away on some details since the last event and have lots of plans to improve on last years event. We have secured a road closure notice from 4pm until 2am so we can have more practice and run more races. That means the entry list can be doubled and have time to accommodate more. Safety barriers will be in place to keep everyone safe. Please include your name, phone number soapbox name and any sponsor you may have. This is important so we can have a list of all the competitors for the commentators on the day. All Soap Boxes must be well constructed with completely functional brakes and steering. Braking with the hands and feet is NOT permitted. Brakes should function independently of the steering and should be connected to and operated on at least two wheels. Original factory products are not allowed. The compulsory dress code consists of a helmet, full length pants, a long sleeved top and gloves. Our thanks the sponsors of this year’s Soap Box Derby, two local and well established company’s Access Automation and Joe Synnott Roofing & Construction. Much to the delight of many the jump will be in place for the entire event this year! When the winner has been crowned the Festival Finale can start with music on the street with the Roamin’ Cadillacs and friends til late! Come on down! This entry was posted in News & Events on July 24, 2015 by roundwoodiewicklow. 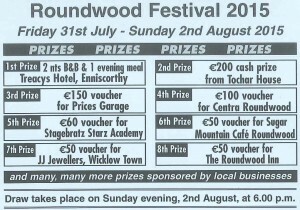 The Roundwood Festival takes place this August Bank holiday weekend. The emphasis is on a funfilled family and community orientated weekend. The organising committee’s aim is to just cover its costs so events and activities organised will not break the bank! The group are very grateful to all the local businesses that generously sponsor the raffle prizes which fund the majority of the festival expenses including insurance, room and equipment hire, etc. So if you are asked to buy some tickets in the coming weeks please give generously – there are literally so many prizes they wouldn’t all fit on the tickets – see list of prizes below. Other businesses sponsor prizes for the events such as the canoe race, tug of war, barman’s race, etc. So this is a real case of our community supporting each other. 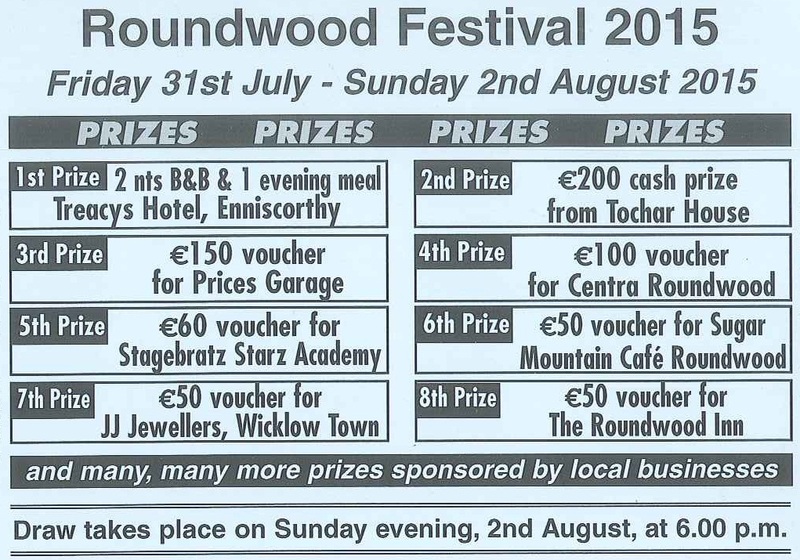 So please look out for the raffle tickets and keep supporting all our local businesses by way of thanks for their generous and continuous support of the Roundwood Festival! This entry was posted in News & Events on July 22, 2015 by roundwoodiewicklow.